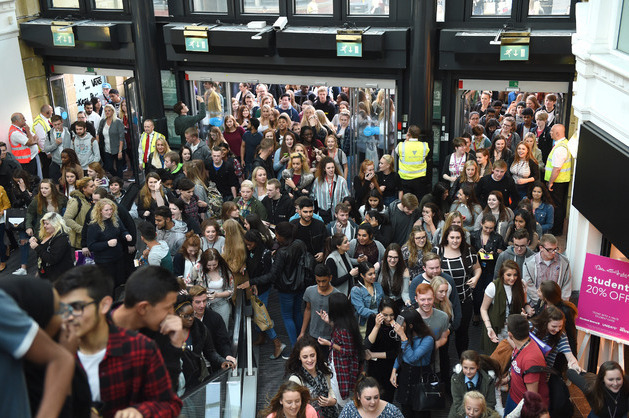 More than 7,500 students flocked to St George’s Shopping Centre in Preston for a star-studded VIP shopping party. Eager shoppers queued outside the city’s biggest shopping centre ahead of the doors opening for the eighth annual Student Shop-In on Tuesday night. Once inside the students from UCLan, Cardinal Newman, Runshaw and Preston’s College, made the most of exclusive shopping discounts from retailers including New Look, Miss Selfridge, Foot Asylum, The Body Shop and more. Students from across the city and beyond then gathered around the stage ahead of the arrival of the evening’s guests of honour, TOWIE star Joey Essex and Ex on The Beach favourite Vicky Pattison. The line-up also featured Jon Clark, Hannah Elizabeth, Luis Morrison and Cally Jane Beech from ITV’s reality dating show Love Island. Rock FM’s breakfast show presenter Darryl Morris was compère for the evening and interviewed the guests on stage. Winners of an online meet and greet competition were introduced to the reality TV stars and the event culminated with one lucky student walking away with a £1,000 cash prize presented to them by the celebrity guests. Winner Bethany Thompson-Lee, 17, from Buckshaw Village, who attends Runshaw College, made it to the stage just seconds before the three minutes to collect the prize were up. One fashion retailer reported a hugely successful night with a 16 per cent rise in sales compared to last year’s event. TV personality Joey, who found fame on TOWIE in 2011 before becoming a hot favourite on ITV’s I’m a Celebrity… Get Me Out of Here, described the famous shop-in as ‘cool’. As well as stores in the centre opening their doors there was fun in and around the centre hosted by businesses from across the county including Popworld, BID Preston and Real Gym. The Student Shop-In is just one of the quality events organised by teams at the shopping centre aimed to attract visitors. Other free events have taken place at the retail venue, such as the recent Summer of Fun featuring giant lawn games, Peppa Pig and Titan the Robot. General manager of St George’s Shopping Centre, Andrew Stringer, said: “Students from across the city and beyond came out in full force and the feedback from our retailers has been extremely positive.